One of the largest Camaro Clubs in Northern California that is open to all years of the Chevrolet Camaro 1967 to today. For over 15 years (1999-2014) Camaro Generations is a family oriented Camaro club open to all years of the Chevrolet Camaro and Camaro enthusiasts. Camaro Generations is based out of the greater Sacramento, California area. Ford created the personal luxury car of the fifties – the Thunderbird – with power windows, power steering, power brakes and all the extra features that appealed to owners. According to Ross Woodman, spokesman for the Sacramento Classic Thunderbird Club, 52,000 first-generation Thunderbird two-seater convertibles were produced between 1955 and 1957. The 1958, 1959 and 1960 models were larger and called the “square birds.” They were followed by the 1961-1963 “bullet birds,” which were like rocket ships and were rounder and bigger. The 1964, 1965 and 1966 models with a more squared-off appearance were known as the “flair birds.” Sequential turn signals were added to the ’65 models. Celebrate the 50th Anniversary of the Ford Mustang! 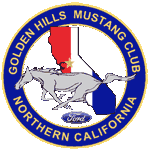 The Golden Hills Mustang Club, established in 1982, is a nonprofit organization, the purpose of which is to promote the admiration, ownership, care and maintenance of the Ford Mustang Automobile – regardless of model year.